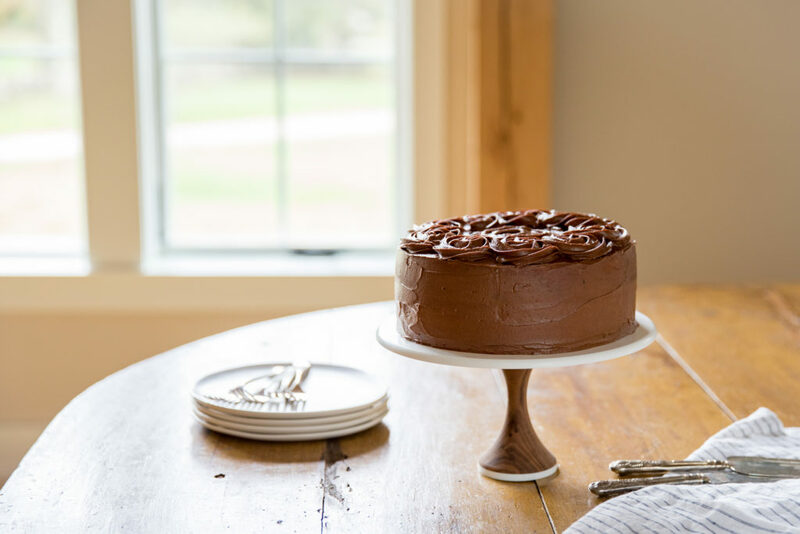 Einkorn Yellow Cake with Chocolate Frosting | Jovial Foods, Inc. Einkorn Yellow Cake with Chocolate Frosting | Jovial Foods, Inc.
Einkorn resists absorption and it is hard to fold it into batters. Whipping eggs and sugar gives extra lightness to einkorn cakes, which tend to bake up denser due to less starch and more protein. It’s crucial to get the amount of fat right because einkorn does not absorb fat like regular flour. 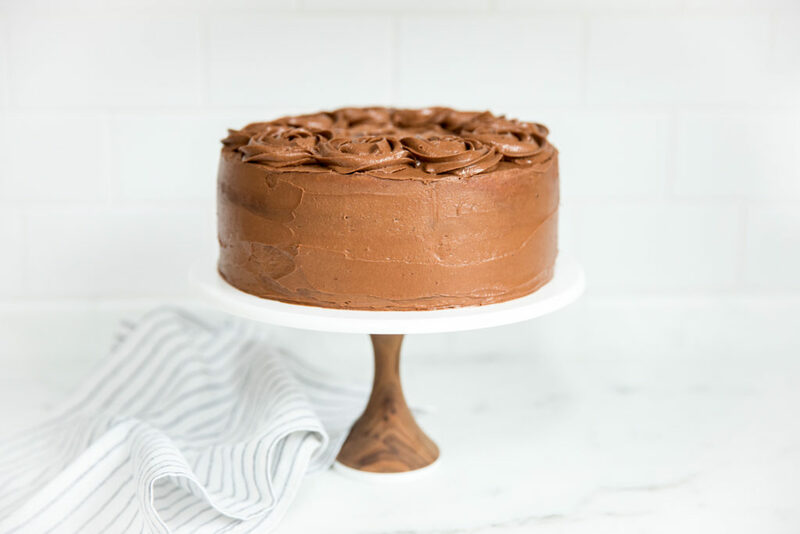 We are publishing the recipe for a single 9-inch round cake because, even if you want to make a double layer cake like the one we did, you should only mix up one cake at a time. Because it is harder to fold einkorn flour into batter, we found that the amount of batter for two cakes was too much and it did not allow us to successfully incorporate the ingredients together. We’ve also developed a really nice Chocolate Buttercream Frosting that contains less sugar than what is typical of frostings. We hope einkorn will always be a part of your life, and that this cake will be baked at least once a year for a special occasion! Make the cake: Preheat the oven to 375°F. Lightly butter the bottom and sides of a 9-inch round cake pan. Place a round piece of parchment paper on the bottom then butter and flour the parchment. In a medium bowl, whisk together the buttermilk (yogurt or milk), vanilla, and butter. In the bowl of a standing mixer fitted with a wire whip, beat two whole eggs, one egg yolk, and sugar on high speed for 2 minutes until thick and pale yellow. Sift in half the flour mixture and using a spatula, fold in the flour until it is almost completely absorbed then fold in half the milk mixture. Repeat with the remaining flour and milk mixture until all the flour is absorbed. Pour the batter into the prepared pan and bake for 25 to 28 minutes until the tip of a toothpick inserted in the center comes out clean. Let the cake cool in the pan on a wire rack for 30 minutes. Invert the cake onto the rack, lift off the pan and slowly remove the parchment paper. Let the cake cool completely for 1 hour more before frosting. Make the frosting: In a medium bowl, mix together the sugar, flour, and cocoa. In a medium saucepan, warm the milk on low heat. Whisk in the sugar mixture and cook for 4 to 5 minutes, over a medium-low heat, whisking frequently, until it becomes the consistency of a thick pudding. (If you are doubling the frosting recipe, you will have to cook for 10 minutes until thick). Pour the mixture through a sieve to remove any lumps, pressing the sieve with the back of a spoon. Scrape the bottom to ensure all of the mixture is added to the bowl. Place the mixture in the refrigerator to cool completely. To cool quicker, set the bowl in a larger bowl filled with ice for 5 minutes before refrigerating. Place the chocolate in a medium heatproof bowl, over a saucepan of simmering water. Stir frequently until the mixture is melted. Set aside. In the bowl of a standing mixer fitted with a wire whip, beat the butter on medium for 1 minute until fluffy. Add the salt and vanilla and beat to combine. Add the refrigerated mixture to the butter mixture and beat for 1 minute until combined and fluffy. Add the melted chocolate and whip until completely combined and fluffy. Assemble the cake: Slice the cake in half horizontally with a long serrated knife. Place the bottom layer on a rack over a baking tray. Spread ¾ cup of frosting evenly over the bottom layer with an offset spatula. Place the second layer on top. Spread the frosting around the sides and top of the cake then smooth with spatula. Add a decorative rope pattern around the edges of the cake with a pastry tip, if desired. This cake can be stored at room temperature for 1 day or refrigerated up to 3 days in an airtight container. This recipe is enough to make a single layer cake with frosting. If you would like to make a double layer cake as we did, you will need to bake two individual cakes and a double batch of frosting. You may make the frosting the day before, but it will harden completely in the refrigerator. To soften, let the frosting sit at room temperature for 3 hours. You should also whip the frosting in the standing mixer, fitted with a wire whip, until it is soft and fluffy again. Previous:Einkorn Oatmeal Chocolate Chip Coconut Macadamia Cookies- Gluten Free Version too! Looks amazing and I want to make it. Would I need to double the frosting recipe for a two 9” layer cake? Thank you Maria! 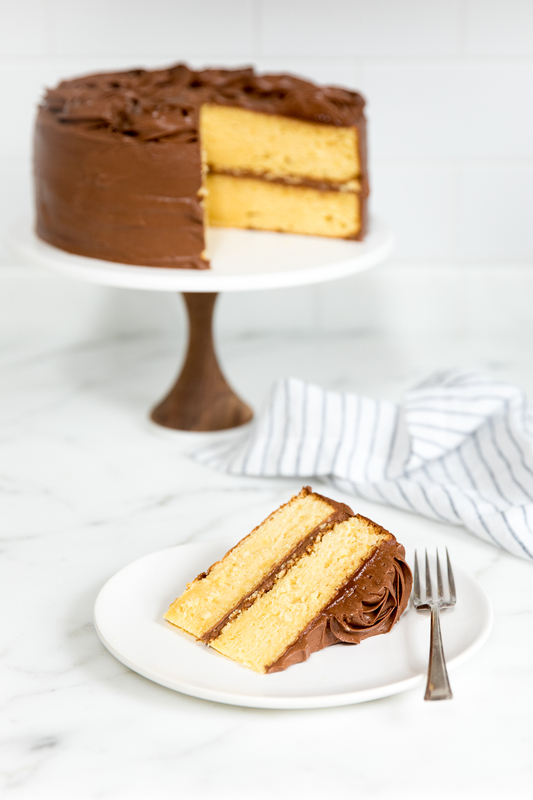 IF you are going to make two 9′ layer cakes you will want to double the frosting recipe as well! Can gluten free flour be substituted for some of the einkorn flour in recepies? Also rye, teff and buckwheat. No, you can’t use GF flour for this recipe. It was created only with einkorn. Do I just discard the third egg white? Thank you! This looks wonderful. Yes, or save it for another use! If I use at least a 1/4 cup less on the sugar, would I have to make any adjustments to compensate for the rest of the recipe? Thank you! There no other adjustments needed, but the cake will be a bit denser with less sugar. Has this been attempted with cupcakes? I baked this cake for Easter and paired it with lemon curd, vanilla buttercream and topped with shredded coconut. I placed the batter into two 6″ cake pans and it worked perfectly! I’ve made many yellow cakes from scratch over the years, using both cake and AP flours, and all manner of mixing methods, with many varying results. This cake recipe is hands-down the best one I have ever used. The crumb is perfect; it is not too dense but sturdy enough to frost and fill, it is moist, and the einkorn flavor takes it to a new level of delicious. Thank you, Jovial, for developing this amazing recipe! It is now my standard! We are so happy you love it as much as we do!